“Maleficient” is is an old story with a new twist that worked for me. When I went in to see the film I was unsure what to expect. But, at the end of 90 odd minutes I must confess I quite enjoyed watching the film. Reimagine hearing the story of “Sleeping Beauty,” from the perspective of “Maleficient,” the wicked witch, who cursed Sleeping Beauty. That is what the film is about and it takes you to a whole different world of fairies and elves and magical powers. Maleficent is a fictional Disney character first introduced in Disney’s 1959 version of “Sleeping Beauty.” This year marks the 55th anniversary of the film. I must confess I have not seen the original film. We meet a young and happy-go-lucky Maleficient (Angelina Jolie), who lives in the moors with other fairies and elves. We watch her friendship with a young and awkward young Stefan (Sharlto Copley) grow. Things take a horrible turn when Stefan unexpectedly turns against his fairy friend. To fulfill his burning ambition Stefan betrays his love, and ends up being crowned as the king. Maleficent is devastated and is deeply hurt. And out of that hurt is born a sense of revenge. When Stefan’s child Aurora (Elle Fanning) is born Maleficient casts that famous curse. Stefan packs off his new born child in the care of 3 fairies to a far-off cottage. How Aurora grows up and what happens to Maleficient makes up the rest of the tale that comes with an unexpected twist. You see she thinks Maleficient is her godmother. I only wish they had shown the 3 impish pixies: Knotgrass (Imelda Staunton), Flittle (Lesley Manville) and Thislewit (Juno Temple) a little bit more. These impish fairies provided the comic relief with their pixie charms and antics with a little bit of help from the wicked witch Maleficient. 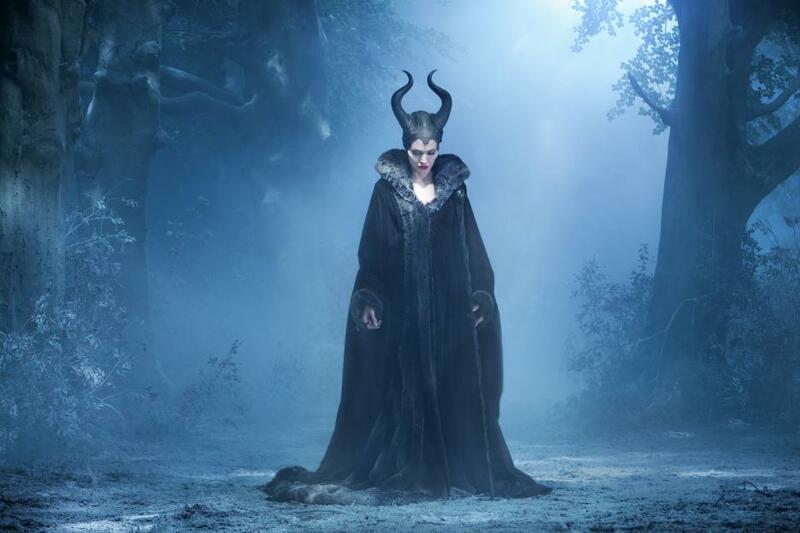 “Maleficient” is Robert Stromberg’s directorial debut. He previously won 2 Academy Awards for production design for “Avatar” and “Alice In Wonderland.” This might explain why the production design of “Maleficient” is striking. It is something that you do notice, especially the fairy world that is a mix of bright and happy colors with darker elements. Linda Woolverton wrote the screenplay for this film. She previously wrote “The Lion King’ and “Beauty and Beast” for Disney. Jolie looks the part of the wicket witch with her striking makeup, horns and black flowing gown. You needed no convincing. She plays the role with great ease and infuses her character with unexpected sympathy that went down well the audience from what I could see. She clearly seems to have enjoyed playing the role of the wicked witch. Fanning is a perfect foil to Jolie’s dark and somewhat brooding character, who is intent in extracting her revenge. She sparkles in her role as the young teenage Snow White. For someone like me, who grew in the pre-Internet world and read conventional fairytale books this film was an interesting departure. In conventional fairytales the world is presented in black and white terms – the good are really good, while the bad are truly wicked. Now imagine a fairytale character that is an amalgamation of good and bad and you will see where the reimagining of the character started. And oh! if you are wondering about the title “Maleficient” it seems to be a combination of malevolence and magnificent and that should give you a hint of what you can expect to see. And since this is a Disney film good almost always triumphs evil, does it not? “Maleficient” releases in San Francisco bay area today. Starring: Angelina Jolie, Elle Fanning, Sharlto Copley, Sam Riley and Juno Temple. Photo courtesy: Walt Disney Studio. Flight 93 took from Newark, NJ to San Francisco, CA on September 11, 2001. The flight never reached its destination. This was one of the 4 planes attacked by hijackers. Flight 93 was believed to be heading towards Capitol Hill in Washington DC, and some passengers onboard the plane foiled that attempt.The flight ended up crashing in a field in Stonycreek Township in Pennsylvania. Mark Bingham, a San Francisco bay area native was one of the passengers that fought with hijackers as his mother Alice Hoagland points out. Hoagland describes how she along with other surviving family members of flight 93 listened to the tapes and heard the fight her son and others put up. Hoagland, a bay area native, was a flight attendant with over 20 years experience and had worked for United Airlines. Bingham was flying on a family pass from Newark to San Francisco and almost missed the flight. When the plane was under attack, Bingham called his mother to let her know they were under attack and that he loved her. That was the last time Hoagland heard from her son. Since the loss of her son Hoagland has been busy working on things that matter to her: Mark Bingham Foundation, LGBT community and airline safety. She is also involved in promoting gay soccer games around the world. A new documentary film “The Rugby Player,” reconstructs Bingham’s life through old photos, video clips and interviews with his mother and friends. Bingham was a gay man, who also helped found San Francisco’s first gay soccer club. He grew up in Los Gatos, and played soccer at his high school and was part of the soccer team at University of California Berkeley. In May 2014 a new 9/11 museum opened in New York city and there are recordings and pictures of Bingham along with others who lost their life on that tragic September morning in 2001. This interview was originally recorded for TV and aired in SF bay area. It had to happen, right? A driverless car? A self driving car with no steering wheels and just an on/off button? All you do is hop into the car, sit back, relax and enjoy the ride. Yesterday Mountain View-based Google introduced its self driving car at the inaugural Code Conference in Rancho Palos Verdes in Southern California. Sergey Brin, co-founder of Google unveiled the self driving car that is built by scratch. And with this announcement you can see that the automotive industry is at the cusp of a potentially huge change and Silicon Valley companies are leading that change. Today, almost all major automative companies from around the world have a Research and Design Lab in Silicon Valley. Here is a video of a self driving car test from 2010 when Google first announced the project. You can see Steve Mahan sitting on the driver seat, but he has nothing to do with driving the car. Mahan is 90% legally blind as he points out in the video. And here is Google’s self driving car that was unveiled yesterday. You can read about Google’s Self Driving Car and how it works. Master Sommelier Richard Dean of Taj Campton Place in San Francisco is a gracious and generous host, who shares his deep knowledge of wines in this interview. There are less than 140 Master Sommeliers in the US, and Dean was the second person to became one, and also the youngest. He grew up in the midwest and studied accounting and commerce. He found himself drawn to wines when he was working in Hawaii. That initial passion turned into a full-time profession. When he became a Maser Sommelier California wines were not the “in” thing, it was wines front he Old World that were mostly served at the table. He has been with the Taj Group of Hotels for many years. In this video interview we find out how he became a Sommelier and answers the question if one has to have a “good nose” to become a connoisseur. How do you choose a good bottle of wine? What wine is paired with Indian food, an eternal conundrum for those who want to serve Indian food. And, he walks us through wines of California and answers that nagging question – why are there so many different wine glasses? How are they different. Every month The Taj Campton Place hosts a wine tasting dinner that features wines from California. Dean has been with the Taj Group of Hotels for many years and has traveled to India quite a bit. It is that time of year again in San Francisco bay area – film festival season. And we are not talking about “talkies,” but the Silent Film Festival of San Francisco, which is one of the longest running festivals in the US in this genre. This year marks the 19th year of the an Francisco Silent Film Festival (May 29-June 4, 2014). This year the festival is paying homage to the Roaring 20’s and features 17 silent films and a few short films. A highlight of the festival is the live orchestra that will play the music for the films. A handful of orchestras are featured in this year’s festival. The opening night film is Rudolph Valentino’s “The Four Horseman of the Apocalypse,” by Rex Ingram. The film premiered in 1921 and changed Valentino’s career and turned him into a superstar of the silent films era. This was one of the highest grossing films of its time. Monto Alto Motion Picture Orchestra will play live music during the screening of the film. A film that caught my eyes is the 1924 “The Epic Of Everest” that traces the 3rd expedition to this Himalayan mountain. Shot by Captain John Noel, the film was recently restored by Britain BFI National Archives. This is an unusual film since it has some of the earliest scenes of Tibetan people from the Tibetan Plateau from the 1920s. The film gives you an idea of what kind of preparation it took to undertake an expedition to Mount Everest. The closing night film is Buster Keaton’s “The Navigator” (1924). The film was directed by comedic genius Keaton and Donald Crisp. This was the fourth film of “The Great Stone Face,” which was Keaton’s nickname. Here is a full line-up of the films at this year’s Silent Film Festival. For tickets and information please visit the festival’s website. This is Nob Hill or “Nabob Hill” in San Francisco. Yes, yes, the term “nabob” is derived from the Hindustani/Arab word “nawab” but morphed into “nabob” when the British were in India. The first reference of the word “nabob” was supposedly in 1612. “Nabob” was used quite a bit in Britain to describe the riches reaped by British officials during their stint with The East India Company in India. In the above video the building with the flags is the famous Fairmont Hotel, which opened in 1907. The hotel, which was almost completed in 1906 was damaged during the 1906 earthquake. After the earthquake local native and architect Julia Morgan (Hearst Castle fame) was hired to redesign the interiors of this landmark hotel. Leland Stanford (of Stanford University) was one of the first ones to build his mansion on California Hill. It was dubbed into “Nob Hill” around this time when the rest of the “Big Four” of the Central Pacific Railways built their mansions in this neighborhood. The other 3 “nabobs” were Mark Hopkins, Collis Potter Hutington and Charles Crocker built their mansions in this area. Modern transportation made this area accessible in the late 19thc. In 1873 when cable cars were introduced in San Francisco, Nob Hill was one of the areas served. A few years later a street car dedicated to this are was introduced. In 1878 Leland Stanford and others helped bring the cable car to California Street. During the 1906 San Francisco earthquake many of the mansions on Nob hill suffered extensive damage. In this video from 1906 you can see the extent of the damage and also catch a glimpse of the newly built Fairmont Hotel that survived the big quake. A word of caution if you plan to visit Nob Hill area, use the streetcar or drive up in your car. 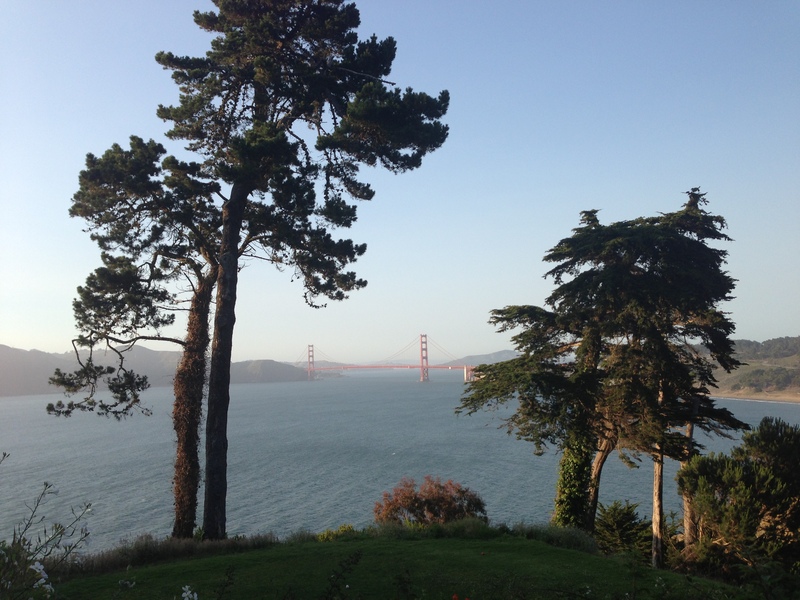 Walking up that steep California Street will leave you winded and breathless as I discovered. But then again, it is your choice and don’t tell me I did not give you fair warning. Here is a view of San Francisco from the top of Fairmont Hotel. Here is a quick peek that highlights some of our upcoming shows along with interviews you may have missed out.